High Wycombe, UK, 26 September 2017: International POS printer manufacturer Star Micronics announces today that it will be joined by leading software provider Nobly POS on Stand 5151 at Restaurant Tech Live (26 – 27 September, ExCeL, London). 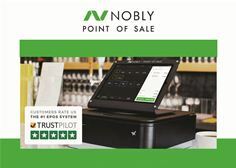 Nobly POS will also be demonstrating its solution on Stand 414 at Coffee Shop Innovation 2017. Founded in 2013, Nobly POS provides a next generation iPad based easy-to-use point of sale system that allows merchants across more than 40 countries to set up their outlet within minutes without expensive on-boarding and support contracts. With an industry leading 5 star Trustpilot rating, Nobly POS has an established presence within the hospitality sector as the Customer Rated #1 Provider. Designed for a range of hospitality outlets including coffee shops, quick service, delis, restaurants and chains, Nobly POS allows merchants to manage inventory and staff, gather business insights with 30+ powerful reports, set up loyalty schemes, take credit card payments, integrate with accounting software and more. The Nobly product is available in the UK, US, Canada and 20+ other countries. ‘We created Nobly POS as a smarter, easier to use and more affordable alternative to the traditional PC-based EPOS solutions. Our team takes great pride in being a trusted technology partner to national and international coffee shops, delis, restaurants and hospitality chains. Our aim continues to be to allow merchants to focus on what they do best, by providing an excellent product and service.” says George Urdea – one of the Nobly POS founders. Nobly POS provides the very latest in innovative POS software and hardware and as such has selected Star’s Bluetooth POS solutions TSP143IIIBI and mPOP™. Designed to work with a range of operating systems including Android, iOS, Linux, Mac OS and Windows, the TSP143IIIBI provides an autoconnect function for iOS after power on or an out-of-range situation, thus ensuring functionality at all times. Featuring a print speed of 250mm/second, a guillotine auto cutter (MCBF 2 million cuts) as well as thin paper capability, the printer provides benefits for the environment and reduced operating costs for the retailer. The cost-effective solution includes the convenience of an internal power supply along with a vertical mount kit in the box. Star’s mPOP allows business owners to benefit from a compact, high performance tablet POS system. As a unique combined Bluetooth printer and cash drawer mobile point of purchase solution, mPOP is low cost and lightweight at just 10cm high and 30cm wide with a sleek design that will complement any counter top. Alternatively, mPOP with front feed receipting can easily be secured under the counter for enhanced space-saving. With intuitive top loading and easy front feed as well as a partial cut guillotine, the thermal printer automatically cuts the 58mm wide receipt. Outstanding connectivity alongside intuitive functionality and simple integration define Star’s unique solution. With the POPPack option that includes a high quality black tablet stand and metal plate, users can successfully create a stylish mPOS station. The POPPack design provides a flexible option with the extra security required within a busy hospitality environment, whilst retaining the mobile element. This provides the ability to securely store or transport the mPOS station at the end of trading.